In light of the new year and all the resolutions flying around in my head, I’ve decided to commit to one. This year I’ll be participating in the Photojojo Project 365. The plan is to post 365 images of cheap food related visuals. It’s my promise to dedicate myself more this year than ever before on reigning in the food budget and sharing the places, recipes and tricks to living below my means. What I’ve learned from 2010 is how to navigate my new (used) iPhone to better document my life in terms of food and post them to my Cheapfoodhere Project 365 Flickr gallery. I don’t prefer using the subpar iPhone camera, but it’s something I know I’ll have with me at a moment’s notice and not have to download, tweak and then upload to Flickr. So, please forgive the photo quality and know that more importantly, I want to reflect at the end of 2011 on my food journey while sharing the sweet and the terrible about what I ate during those 365 days. I plan to document people, places and things that meant something to me that day and will help my readers see what Cheap Food Here really is, in a more visual way. I’ll be adding a gallery for reader-contributed photos so feel free to email me a photo (ashley (at) cheapfoodhere (dot) com) to post or comment with a link to the photo with permission to use it on the site. I can’t wait to see how others will journey through 2011 with Cheap Food Here. Enjoy it! Making empanada dough correctly is the hardest part about the whole process of putting together the perfect empanada. I spent some long hours trying to get the dough just right; looking at every recipe on the internet I could find, and then some. I tried recipes with yeast, baking powder, corn flour, butter, shortening, spices, eggs, etc. None of them turned out the way I wanted. To save you time, I have put together a list of empanada mistakes so you can read them without actually experiencing the same problems I had. A lot of people say that Costa Rican Food isn’t all that great and that it’s unimaginative at best, however I beg to differ. Having lived here for just a year and a half, I have been able to sample a lot of local cuisine, but I am far from an expert. Food in Costa Rica has a rich history and deep meaning for the people here, which for me deserves a lot of respect when being critical of it’s food. Even though I’ve been living here for over a year and a half, I haven’t quite yet embraced preparing typical food at home. Okay, so maybe I have gotten too comfortable with what I like to cook and the ingredients I know well, but now is the perfect time to explore. 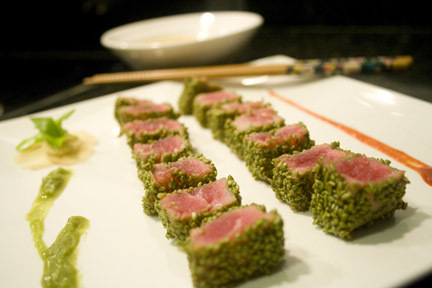 Recently, I vowed to find the most unique dishes to Costa Rica and tweak them into the perfect recipes. But before we get down to business, we have a few terminologies to sort out and some background to familiarize ourselves with. First, the terms I’ll be using in this post may seem foreign to you (duh, because they are) but they’ve become a permanent part of my language living here. Ticos or Ticas are the native people. The name originates from their specific dialect of Spanish and how they’ve always added a -tico or -tica to the end of words, as in ‘little’ or ‘small’. For example, I chuckle when I hear someone say ‘quiero el chikitico’ or ‘I want the small one’. This is not common to end words with -tico or -tica, but it is common in any Spanish-speaking country for them to say “cafecito” (little coffee), “pancito” (little piece of bread) or “whiskito” (you guessed it: a little whiskey). Here’s a little cultural background. If there is one common thread among all Ticos, it’s their passion for futból and their devotion to either La Liga or Saprissa. Here, your blood either runs purple and white or red and black, or you’re not Costa Rican at all. You know when it’s game day and it’s even easier to know when a goal is scored b/c no matter where you are in the country there are car horns blaring when there’s a GooooooOOOOOOOOOOaaaaaaaaaallllllll!!!!!! And what do the Ticos do before, during and after the games? Why eat of course. Which is why I chose the recipes I did, so you could maybe get the taste of what a traditional meal of the futból-loving Ticos is like. Now for the ingredients that you’ve most likely never heard of. 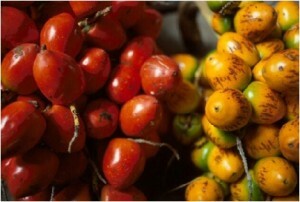 First we’ll start off with the pejibaye, or peach palm, which grows and is exported more in Costa Rica than any other country. The flavor is similar to a boiled peanut but with a milder flavor and a different texture. You can find them all over the sides of the road where locals set up giant pots boiling over a flame. Ticos love to eat them with mayonnaise and salt, but I’ve found them to be most delicious as a creamy soup. You can find them for about $2-3 for a kilo (2.3 lbs). 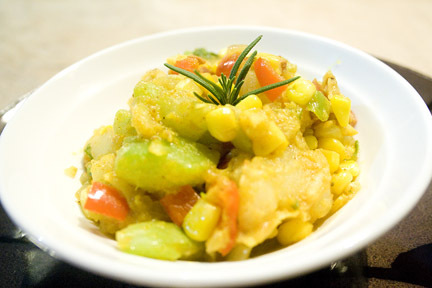 Then there’s a chyote, which is a type of squash that comes in either white or green and is a very inexpensive vegetable use for side dishes and what they call ‘picadillo’, which essentially means small pieces. Chyotes are about $0.30 a piece and recipes typically call for 2-4 units and rarely do you need any more unless you’re serving more than 6 people. But I beg you to be careful when you’re peeling and chopping the chayotes. You need to grab the vegetable with a towel or wear gloves. The reason for this is because they leave a strong film on your hands that acts like children’s glue but much, much worse. There’s not real way to get it off until it wears itself off. Now to the recipes so you can judge for yourself if you agree that Costa Rican food isn’t noteworthy, but I have a hunch that you’ll love it. Slowly mix in the flour and then add the chicken broth. Bring to a boil. Add chopped pejibayes, turn down the heat and simmer with the bay leaves and bundle of thyme and rosemary for 10 minutes. Remove bundle and bay leaves. Garnish with fresh chopped cilantro and serve hot. In a medium-sized bowl mix 3 cups of All-Purpose flour and 1 tablespoon of salt. Cut 1/2 cup room temperature solid vegetable shortening into pieces and place in bowl with flour mixture. Using a pastry cutter, cut in shortening until you have a cornmeal texture. If needed break up large pieces with your hands. Slowly incorporate 3/4 cup of luke-warm water, adding a little at at time until a dough ball forms. The dough should not be sticky and should be kneaded about 10 times. If needed, add more flour or water to reach the appropriate consistency. Cover with plastic wrap and let rest for 1 hour. 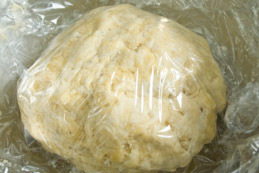 If you’re making the dough in advance, wrap with plastic wrap and refrigerate. However, bring dough to room temperature before assembling empanadas. Soak beans in a bowl of water overnight and then drain. Finely chop the onion. In a slow-cooker, place black beans and three cups of water, the bay leaf, half of the chopped onion and cook on high for 3-4 hours. Strain off excess juices and remove bay leaf. Bring two cups of water to a rapid boil and pour in rice. Season with 1 teaspoon of salt and let cook on medium heat for 15-20 minutes until rice is fully cooked. In a large fry pan, melt butter and saute remaining onion, garlic and bell pepper. Cook until onion is translucent, add green onion, then pour in rice and beans and mix until incorporated. 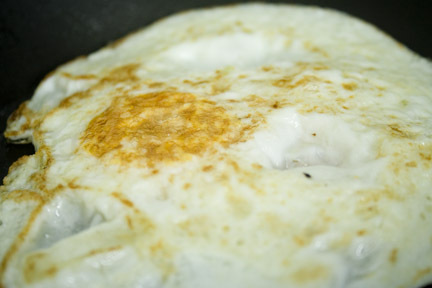 In a separate pan, scramble egg with milk until fully cooked. Add egg to rice and bean mixture. Finally, chop cilantro and add to the mixture. Allow to cool. Thoroughly clean the work surface and give yourself plenty of room. You’ll need flour, a rolling pin, a circular cutter (6-8”), spoon, water, cookie sheet and your filling. Sprinkle flour on the work surface and pull a piece of dough off that’s about the size of a lime. Begin to flatten the dough ball in all directions until the dough is roughly 2 millimeters thick. The dough shouldn’t stretch much further than the diameter of your cutter, or you might have used too much dough. Press the cutter through the dough completely. Remove excess dough and incorporate it into the next dough ball. It’s important to note that once the dough has been rolled and stretched, it is much harder to do it a second time, so using the least amount of dough per cut is ideal. Once you’ve rolled out the dough and cut out the circle, it shouldn’t shrink any. Moisten the edges by dipping your fingers into egg wash and gently spreading a thin layer around the edges. Spoon out 2-3 tablespoons of filling onto the upper half of the circle. Fold the bottom half of the dough up over the filling and press the edges together repositioning the filling inside if needed. It’s important to have the right amount of filling so it won’t break open or leave it hollow after cooking. You should fill it just enough to still get the empanada to close. There are many ways to close and shape empanadas but I prefer the pinch and twisting closure. Starting with one edge pinch the edge between your finger and then fold the corner up over itself by 2 cm and pinch the new fold to seal it. Repeat the motion all the way around the empanada by pinching and twisting the dough to create a rope-like edge. When you reach the other edge simply tuck the corner under and pinch closed to seal it off. To cook them, heat up some vegetable oil, coconut oil, palm oil or peanut oil in a medium-sized pot to a medium-high temperature. Be sure to test your oil before dropping in the empanadas, if you drop in a little piece of extra dough, it should boil easily but not crackle, pop or boil too rapidly. If this happens, reduce the heat of the oil before submerging the empanada. When the oil is ready, submerge two or three empanadas in the oil and allow them to cook for 4-6 minutes until golden brown. Watch them carefully so they don’t burn. 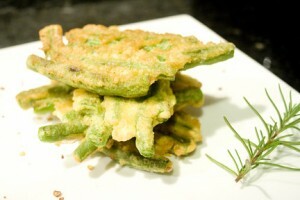 In a medium-sized sauce pan, boil green beans in water with salt until al dente, with a slight crisp. Separate the eggs with whites in a small bowl and the yolks in another. Beat the whites until slightly stiff. Add the yolk, flour and salt and mix. Form groups of 6 green beans, soak in batter and fry in a pan with olive oil on medium-high heat, turning once after 2 minutes. Place in a hot oven while you’re cooking the rest. Eat immediately. 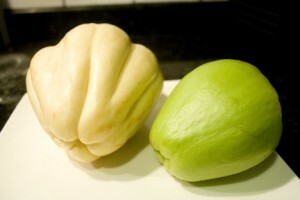 Using gloves, peel chayote and remove pit. Cut into 2 cm pieces and place into a medium-sized pot. Cover with water and boil for 15 minutes. Drain and set aside. Meanwhile, fry bacon in a large fry pan turning occasionally until well-cooked but not burnt. Remove from pan, let cool and break into small pieces by hand. Peel and dice the onion, mince the garlic and chop the bell pepper into small pieces. In the same pan with bacon grease, add chorizo (remove from casing), onion, garlic, bell pepper and celery. Cook on medium-high heat until slightly soft, about 2-3 minutes breaking up the chorizo as it cooks. Add butter, corn, cilantro, chayote, cajun seasoning, black pepper and cumin. Mix well. Salt to taste (varies depending on the type of cajun seasoning). As seen in a previous post. In a large pan, melt the butter and saute the plantains on medium heat until golden. Add 1 cup of sugar, cinnamon, nutmeg, clove, lime juice and vanilla. Stir for 1 min. Add water and sprinkle on the remaining sugar. Reduce heat to low and cook until the liquid is reduced and caramelized. Serve hot, or let cool. Well, the day has finally arrived and Cheap Food Here has put themselves out there for the world to critique in Week 1 of Project Food Blog put on by Foodbuzz.com. This first entry is being judged on how true it is to the very heart of the site, and in our case we’re obsessed with saving money and making delicious food at the same time. 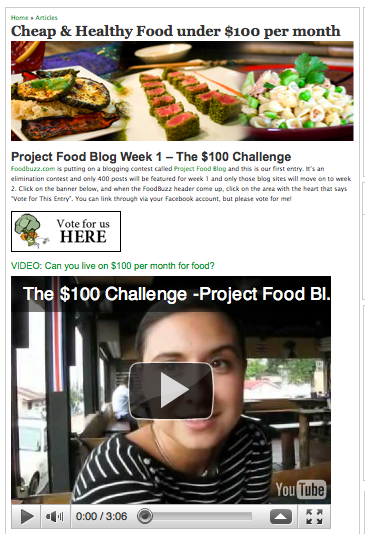 When you vote, click the banner below and when the Project Food Blog header comes up on top, click on the Heart that says “Vote for this entry”. You can log in with your Facebook account in order to cast your vote. Our post highlights a challenge to ourselves and everyone out there to live off of just $100 per person per month for food. Some people think it’s downright impossible to do and others know it’s possible but think they’ll be eating only rice and beans for the month. We’re out to prove everyone wrong and at the same time enlighten everyone, no matter what country you live in, that with the right planning, menu and shopping, you can significantly cut your food costs, all the way down to $100 per month. We were inspired by the many people we saw and spoke to daily that spend a ridiculous amount of money on food because they go out to eat too much or just buy things frivolously in the grocery store. Creating a food budget is hugely important when you’re trying to pay down your debt and truly begin building wealth. It’s a major part of your monthly expenses and you don’t have to give up delicious food in order to save money. 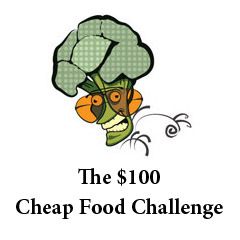 Cheap Food Here is providing the menu, tips and support you need in order to cut your spending. We’re passionate about food and more passionate about saving money. So, if you have the time today, please vote for us so we can move on to Week 2 of Project Food Blog and check back here every two weeks for the next entry. Thanks to all of our readers and those enthusiastic about the same things we are. VIDEO: Can you live on $100 per month for food? What’s A Healthy Food Budget? Now, a little background: the Cheap Food Here family follows the Dave Ramsey Total Money Makeover very closely and have worked hard to get to Baby Step 4. Our food budget for two people is currently $500, which includes $300 for groceries and $200 for eating out. This is our comfortable point now that we are no longer paying off debt, however, when we were doing the debt snowball and attacking our consumer debt and student loans with ‘gazelle intensity’, we we were spending around $250 per month in total food cost (groceries and eating out). Down here in Costa Rica we have found that some families spend over $1,200 per month on food for a family of 3 adults and 2 children. This number may not seem too shocking, but know that they, on average, earn less than $2,000 per month in total household income. The percentage of their income spent on food is over 60% when it should be around 5-15% or roughly $300. However, most argue that this is impossible. The key to reducing food costs each month is research and planning. Most people don’t think about needing to do research before hitting the farmer’s market or grocery store, but it’s imperative to keep from overspending. The food budget can be a large part of your spending each month, but it doesn’t have to be, especially if you are in the early stages of paying off debt. So, the quest for a food budget under $100 begins. First we’re going to look at cheap and healthy recipes that are tried and true for our family and make a menu for each week. With this menu, we’ll focus mostly on fresh, local food that’s in season that we can buy at the farmer’s market. First, let’s take a look at what we’ll have to give up or change about our current eating habits, some of which were mentioned in the video. Drink water with or without lemon instead of bottled juices, sodas or other sugary/sugar-free drinks. Below is the cheap food menu I’ve put together to get you started and prove you can eat healthy and fully on $50 per week for two people. 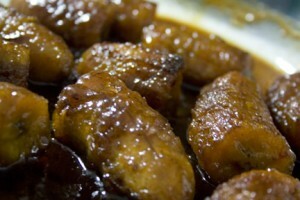 Some of the recipes in the list below are from Cheapfoodhere.com and some are from our favorite foodies. Please refrain from using canned goods unless you have them already, but know that you are getting less than half of the nutritional value from canned goods that you would from fresh or frozen produce. With a lot of the recipes, it’s good to reduce the amount of an ingredient that is expensive (example: cheese or meat) or substitute it for something less expensive and perhaps more healthy. Growing your own produce and herbs is a great way to save money and it can be done in planters too if you don’t have a back yard. If you’re not growing, try to support your local farmers first, but sometimes their prices are just too high. Some stuff you have to go to the grocery store for, but there is a great resource to check pricing before ever venturing out; www.mygrocerydeals.com keeps you in-the-know when it comes to checking cheap grocery prices in the United States. Make sure when you go shopping, you stick to the list, and only to the list. It is your map, your guide, your blinders. However, if you see an item that could make a perfect substitute (example large tomatoes instead of Romas) but is cheaper, buy those instead. We’re looking for deals here, so keep your eyes peeled. Some of the items on the list you’ll see don’t have prices, which indicates it’s something I already had. You can use this sheet to fill in prices on your own to help you better prepare for the upcoming week of meals. The sheet is organized by meal, however there is a lot of cross over, so if it was on the breakfast list, you won’t find it again under lunch, dinner or snacks. You can also organize the list by aisle if that’s easier. The basis of how I chose the meals for the week was looking first at what I had and could then in turn spend less on groceries. It’s best to use all of the items you already have to make sure they don’t go bad and end up getting thrown out anyway. You’ll notice that the Week 1 Shopping List goes well over the designated $50 per week budget for two people, however, a lot of items will be left over for future weeks. Stay tuned for follow up posts for the remaining 3 weeks of the month. Good luck and I’d love feedback from those who are accepting the challenge. Homemade pizza is some of the best cheap food around. It’s no wonder there are a million pizzerias around, the margin on ingredients is great. My husband is Italian so he’s been honing his pizza dough skills throughout the years we’ve been married. It can be tricky business, not only to get the dough consistency right, but the flavor, tossing and cooking to perfection is a definite task. We love making homemade pizza and saving leftovers for lunch throughout the week. We try to make ‘healthy’ pizza, which in our minds includes whole grain dough, sometimes adding ground flax seed, using mostly vegetables and staying away from pork products or processed meats like sausage or pepperoni. This takes a lot of the greasyness out of the pizza and in turn the calories and fat. 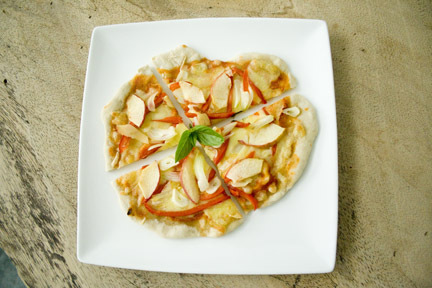 The recipe below for homemade pizzas was inspired by our original post of Costa Rican Homemade Pizza. You can find the recipe and instructions for the dough there. This time we added some apples for a slight bit of sweetness and garnished it with fresh basil that knocked it out of the park. It’s simple to do and you can either take it fully cooked with you to work and reheat it in the microwave or toaster oven or just eat it cold. It’s THAT good. Enjoy! Preheat oven to 400 degrees and place pizza stone inside. Split your dough ball into quarters and place two of the dough balls into plastic wrap and into the freezer for another time. On a floured surface, stretch the two dough balls out into the crust size you want, bake for 2 minutes and remove, leaving the stone in the oven. Spoon a generous amount of marinara sauce onto the dough and cover with mozzarella cheese, bell peppers, garlic, onion and apple slices. Remove and let sit for 2-3 minutes, sprinkle with fresh basil pieces, cut and enjoy. This recipe below for Eggplant Parmesan (I love how certain delicious food words need to be capitalized like Parmesan) is a great example of how reducing the amount of meat or removing it altogether from a dish can save you a lot of money. For this dish, the total cost was about $3 since we only used one eggplant and made homemade marinara sauce. However, it’s even better to make enough to have leftovers the next day for lunch. I do love the chicken Parmesan variety but this is a great change and is healthy to boot. Our ingredients for the eggplant Parmesan were found at the Pavas Farmer’s Market which is always such a great experience. You get to know the people who represent the farmers and understand a little bit more about where your food comes from. This is a huge way to find cheap food because there are so many farmers represented that they have to keep their prices reasonable. Unlike the grocery stores who know once you’re in the store, you’re more likely to buy what you came for no matter what the price. At the farmer’s market you can just go two stands down and find the price you want. It really keeps everyone honest and in turn saves the consumer a lot of money. My husband and I can go to the farmer’s market and get three reusable bags full of produce and spend less than $20. However, you can’t find all ingredients so you have to go to the grocery store for things like pasta and Parmesan cheese. We omitted mozzarella cheese because we are trying to reduce our dairy consumption and it’s cheaper to do without it in this case. Feel free to add it because I know how delicious it is for this recipe. So, let me get to the recipe so you can see just how easy and cheap it was to make eggplant Parmesan. In a medium-sized pot, fill 1/2 to 2/3 with water and bring it to a boil. Break spaghetti noodles in half and toss into the water. Season water with 1 tsp of salt and 1 tsp of olive oil. Let boil for 7-8 minutes or until tender. Remove, strain and place in back into the pot with 1/2 Cup of reserved starch water. Mix in 1 Cup of marinara sauce and stir until completely covered. Meanwhile, set up two large plates. In one, place breadcrumbs, oregano, garlic powder and salt and blend together with a fork or your hands. In the other plate, crack the egg and scramble with a fork. Slice the ends off the eggplant and then into thin vertical slices about 1/4 to 1/2 inches thick. Drag each piece of eggplant into the egg, covering both sides and then pressing it into the breadcrumbs also covering both sides. Preheat a large fry pan on medium heat with 3 tablespoons of Olive Oil. Place breaded eggplant into the pan and fry for 3-4 minutes per side being careful not to burn the breadcrumbs. 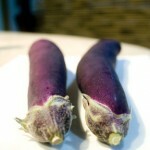 To plate the dish, scoop out a portion of coated spaghetti noodles beside two pieces of eggplant. 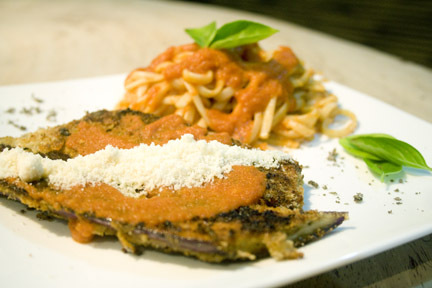 Cover eggplant with 1/2 cup of marinara sauce on each plate, top with Parmesan cheese and enjoy! Egg sandwiches are an easy and cheap staple breakfast food since you’re more than likely going to have eggs in the refrigerator on any given day. 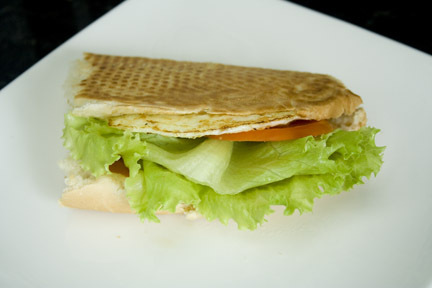 Everyone has different preferences on how they like their eggs cooked; from fried over-medium to scrambled with tomatoes and onions to fried hard, this type of sandwich allows for almost any type of cooked egg. When considering breakfast recipes to start off your day, remember to include portions of fruit as well as protein and fiber. These will give you the nutrients you need to get moving in the morning and sustain you until lunchtime or your mid-morning snack. Although this breakfast sandwich doesn’t seem to have fruit in it, it does have tomato, which is technically a fruit, but I prefer to make a fruit juice shake to go with it. Recently we purchased a waffle iron with removable plates that reverse as a flat surface, which is ideal for sandwiches, reheating burger patties or making tortillas. Using a toaster is great, but there’s something about the press that gives the bread the perfect crisp without drying it out or risking toasting for too long. Cheap Food Here loves kitchen gadgets and those that have a multi-purpose. Okay, so here’s a basic recipe for a pressed egg sandwich. The ingredients and instructions are for two sandwiches. Let me know what you think. Heat a small frying pan with 1/2 tsp of oil on medium heat for 2 minutes or until hot. Preheat the sandwich press. 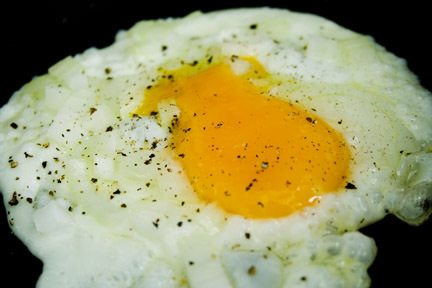 Crack 2 eggs into the pan and place 1/8 C. of chopped onion on top of egg and 1/4 tsp of cumin sprinkled evenly. Cut sliced baguette into two pieces, one for each sandwich. 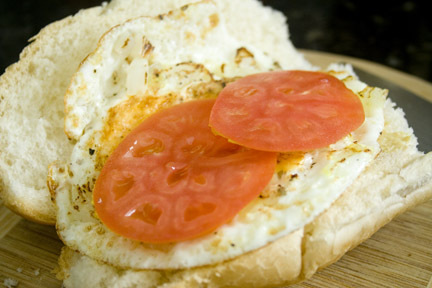 Remove egg from pan and place on sliced baguette, smeared with dijon mustard and add two thin slices of tomato on top. 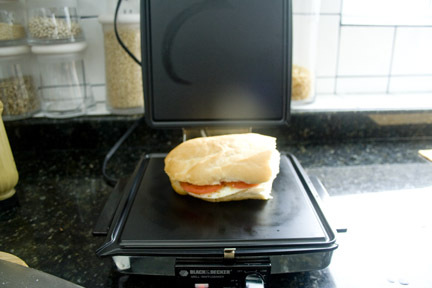 Close the sandwich and place on the heated sandwich press (or use a large, flat skillet). Pull down the lid and press for 1 minute or to desired crispness. Reopen the sandwich and place a piece of lettuce inside, re-close and enjoy. Hopefully you’ve seen the soy milk alfredo pasta recipe or perhaps the soy milk pancakes post, but make sure you check out the soy milk waffles recipe below. It’s a doozie. Lately I’ve been weaning myself off of dairy products…well, trying my best to do so. I have been experimenting with recipes where soy milk can be an easy substitute for regular milk, which can be difficult because the flavors and consistency vary so much. This time the end result was great and I believe now I’m an official soy milk pancake and waffle kind of girl. Make sure you use the vanilla variety and if you don’t have it, just add 1/2 tsp of vanilla extract to your plain soy milk. Breakfast can go so many ways with waffles. Sweet or savory, round or square, syrup or cream sauce. There’s a restaurant here in Costa Rica that my husband and I frequent called The Waffle Place, which I’ve blogged about before. I could only possibly aspire to create what they serve daily to their customers. They’ve nailed the creamy cheese sauce (yes, full of dairy, but if you must, do it right!) over savory ingredients like fried eggs, bacon, ham or hash browns just to name a few, but also give a nod to your sweet tooth if that’s your preference. This is one of those breakfast places that you just know you’ll be satisfied when you walk out. I’ll be working on some cheap savory waffle recipes in the near future now that we’ve invested in a waffle iron/sandwich press. I’ve learned too that using waffles as a starch when preparing dinner can be that intriguing twist that gives the perception of gourmet, while still being inexpensive. If you create a savory dough with fresh herbs and spices in the batter, it can easily replace it’s more boring counterpart–the dinner roll. It’s hard to imagine at first how delicious a waffle can be with dinner, but check out this recipe which uses couscous, mushrooms and herbs in the waffle batter or perhaps a pesto waffle topping. Well, onto the sweet breakfast waffle, which is a staple cheap recipe to have handy. Preheat waffle iron. In a medium-sized mixing bowl with a pour spout, sift together flour, baking powder, salt and cinnamon. Stir in soy milk and eggs until mixture is smooth. Pour waffle batter onto the hot waffle iron filling each section. Cook until browned, about 8 minutes. Meanwhile, prepare the mango topping. Peel and pit mango and slice into small pieces. In a small sauce pan, place diced mango, maple syrup and cinnamon. 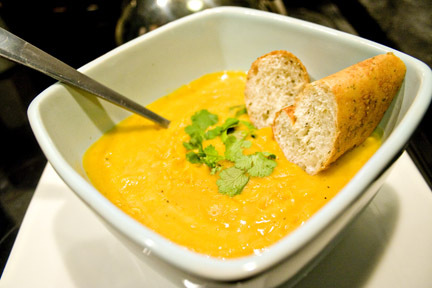 Cook on medium heat until the mango is tender, but not mushy and the sauce has thickened. About 5 minutes. One of the consistent things happening in my kitchen is the exploration of Asian cuisine and this pan-seared tuna is no exception. The flavors and fresh ingredients used in Thai, Japanese, Chinese and Vietnamese food have led me to explore the sauces and traditional dishes of East Asia. The Korean kimchi is also super-easy to make and here is a great kimchi recipe from a fellow foodie. One recent variation of a Thai Green Curry was part of an empanada series I did. 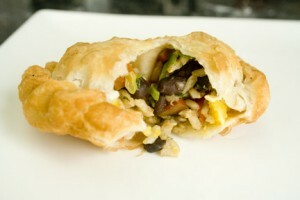 Check out the recipe on the chicken empanada recipes page. 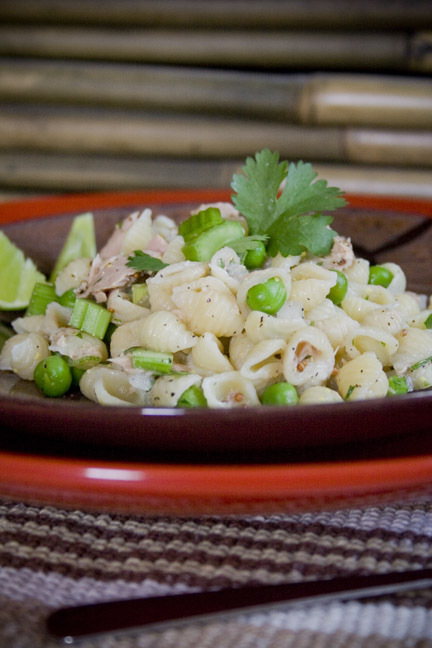 You might also like the wasabi cold pasta salad I did awhile back.